What we gain through loss . . . This past week I lost a large part of my past. 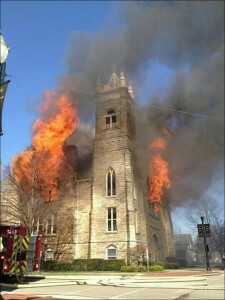 The church I grew up in, Ada 1st United Methodist, burned to the ground. NOTE: Now, please know that I’m well aware that the “church” is not the building. I hope you read on to see what I’d like to talk about . . . Many memories happened at this church. Weddings of my cousins and friends. Funerals of dear people from Ada including grandparents. Making pumpkin pies and hard tack candy for our youth group fundraisers. Holding hands with my first girlfriend while I was supposed to pay attention to the service. And most of all, tons of experiences that shaped me as a young man and helped define my faith. Also, this past week, I learned of a friend’s, Dawn Hrdlica-Burke, loss of her father. Three others facing serious, if not life threatening, health situations. A continued group of people who remain jobless, and several folks near me recovering from the devastation of recent tornadoes. Now, if you read my blog with any regularity, you know that I’m generally an extremely positive person !! It’s not a facade or on-line persona, it’s who I really am. So, when significant things hit home they really hit home. It made me think . . .
You see, when I posted on Twitter and Facebook that my hometown church had been destroyed, I received messages of empathy and encouragements from literally around the globe. That floored me !! I was so thankful that I had people that cared enough to reach out and give a kind word. And then I thought again . 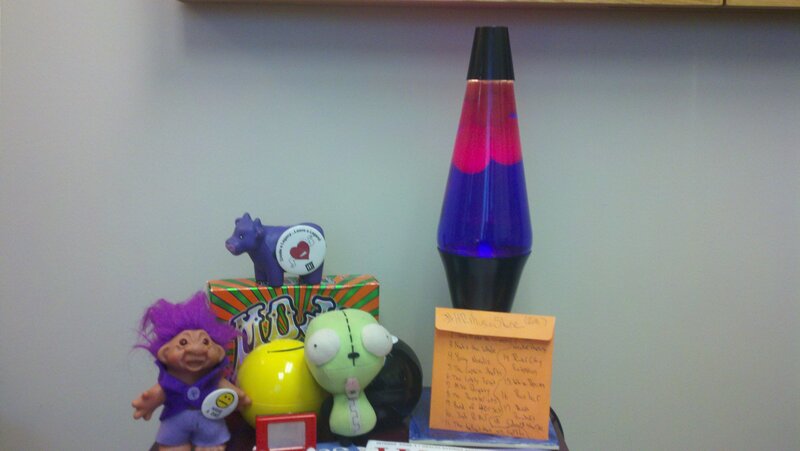 . .
Every day in the workplace the people around me are going through “stuff” just like this or worse. Do I take the time to see if they’re truly okay? Or, do I do the obligatory “Hi, how are you?” waiting for their inevitable answer of “Fine.” We continue to be polite with each other because that next e-mail or task is really what we’re focused on vs. taking the time to see how someone truly is. The fact of the workplace is that we want people to focus on the “stuff” we think is truly important like processes, projects and time frames. We don’t want to deal with people’s “stuff” because that takes too much time, and what if they truly want me to care? As I mentioned before, I was floored at the responses I received and am thankful that I have people who feel close enough to share their thoughts. However, I truly feel that many people walk through the doors at work every day with life’s struggles in front of them, and they may have few, if any, people supporting them through what they’re facing. It’s time for HR to be the model and break this distant approach with people. People DO matter and it SHOULD matter to us how they’re doing. It may get messy and you may have to act, but isn’t that great? We need to be the ones taking the time to see how people really are. It may be the ONE thing they’re looking for – a genuine connection at work. This week, break the mold. 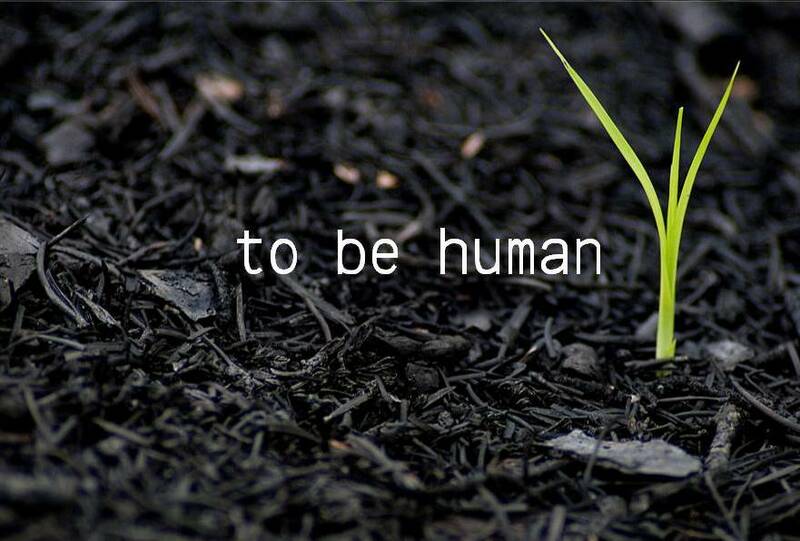 Be the Human that others need. Take the time to get involved with their “stuff.” It will change the world !! Author Steve Browne (Admin)Posted on March 18, 2012 Categories HR Strategy, LeadershipTags Caring, connections, culture, Difference, employee relations, encouragement, HR, Human Resources, Leadership, Life6 Comments on What we gain through loss . . .
Get Your Hands Dirty !! This weekend my wife asked me to start sprucing up the house for the impending graduation gathering for my daughter in three months. I needed the nudge because I was dreading the work ahead. I love being outside, but this level of yardwork was going to be massive !! One task was to realign the wall I constructed several years ago around our front landscaping. There are 150+ pavers that span the front of the bed. Now, this wall has needed attention for some time, and I would see that one or two pavers were out of line, and I’d get them back into the wall with minimum effort. However, when I looked at the work in front of me it was more like an orthodontist facing a challenging set of crooked teeth. I had to get my hands dirty and fully throw myself into the project in order to see a better end result. As I sit here typing, I’m exhausted and yet invigorated !! This simple project reminded me that we all need to reexamine how we do HR. How many times do we see systems that need our attention, and we do a quick fix or update just to give it a little more life, when it needs a true overhaul? How often do we sit behind our desk and shoot off an e-mail when we could go and see someone face-to-face to see what their situation entails first hand? How often are we critical of how others handle HR situations, when we could be more integrated with them to help them succeed? How often do we look for “best practices” when we should be creating “next practices” ourselves? This list could go on and on. So, the opportunity before us is pretty simple. We need to get our hands dirty. This week take a look at the “wall” that you see every day and see if it can be torn down, reconfigured and brought back to life. It’s worth the work !! Author Steve Browne (Admin)Posted on March 11, 2012 Categories HR Strategy, LeadershipTags Change, Difference, encouragement, focus, HR, Human Resources, LeadChange, Leadership, Life, SHRM4 Comments on Get Your Hands Dirty !! This weekend my daughter’s basketball career came to an end. She is a senior in high school, and her team was beaten in their first tournament game. I knew that we’d have these “last” things during her senior year, but it was still very tough. But, it was amazing as well. You see this year was different than most with basketball. My daughter is phenomenal. If you remember nothing else from this post, you need to remember that. Two days before tryouts, her coach asked to talk to her before practice started. The coach told my daughter she needed to make a choice. She told her how much she cared for her, and that there was a place for her on the team, but she would never play. This was devastating to say the least. My daughter, like all kids, had worked for countless hours and years playing basketball. She’s always been a great role player and never the star. She knew that and so did the coach. The coach told her that she’d like to offer my daughter another option for her Senior year – to be an Assistant Coach. My daughter balked because she thought that was another word for “manager.” She was hurt and didn’t know what to do. The coach asked her to think about it overnight, talk to her parents about it as well as other girls on the team to get input. That night I received a call from the coach asking me how my daughter was doing. I told her that she was hurt, confused, and there were a lot of tears. The coach asked me if my daughter told me about their conversation, and I said she had. She told me how much she cared for Mel and our family being involved with the program. I told the coach that I absolutely understood her position and that I appreciated her being up front with my daughter. So, my daughter was Coach Mel this year. She helped in many ways and was more included in things than she ever was as a player. A few weeks ago, my wife and I escorted her across the court during Senior Night along with all the Senior players. My daughter showed her strength as a team player and a leader as a coach. We couldn’t be more proud. Mel’s coach did something that we in the HR and business world need to do more of: (1) Care for our employees, (2) Recognize their strengths, (3) Be candid about their role and how they can best contribute and (4) Allow them to do that and flourish !! I really appreciate that Mel’s coach took the time to keep her indcluded and create this role for her this year. She has been, and will continue to be, an incredible part of our daughter’s life. She has left a permanent mark of a positive role model. She’s imprinted our family’s lives as well along with the other girls and families in the program. So, even though the season ended this weekend, her actions will last forever !! Author Steve Browne (Admin)Posted on February 19, 2012 Categories HR Strategy, LeadershipTags employee relations, employees, encouragement, Human Resources, Leadership, Learnings, Life8 Comments on Thanks Coach !! 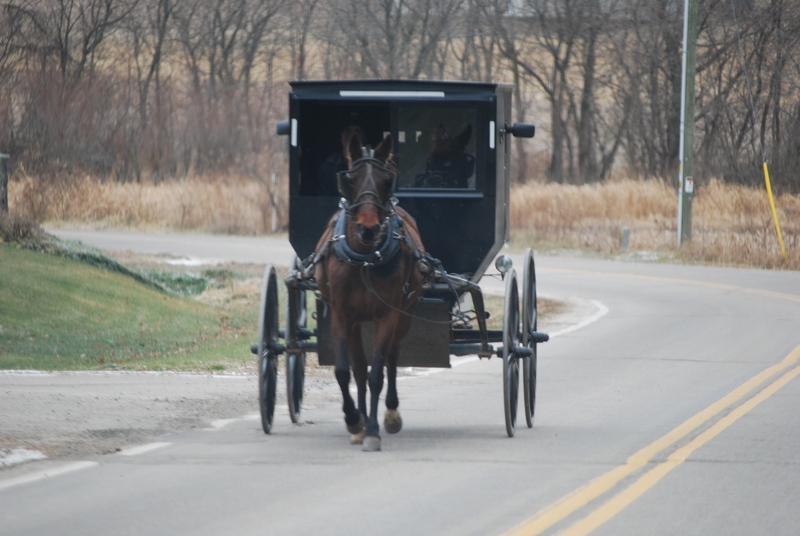 This past weekend I had a real treat by spending it in Amish Country in Ohio. It gives a whole new perspective on life because this culture chooses to live life differently than the vast majority of us !! This post isn’t a commentary on the Amish, but it is an observation. As I watched the buggies passing me by and sampling way too much amazing cheese, I noticed a sense of contentment that I don’t see in many people. These good folks lives are not only are based on their faith, but also on what they choose what to fill their lives with. The brash realities of a world that exists in a completely opposite realm faces them every day, and yet they continue to live their lives with pride. When I step back from these conversations I try to look and see what is making them “busy.” All of us are full. No one says they have extra time on their hands – quite the contrary. But, what are we filled with? Are the things that consume our daily lives productive, or not? It’s not hard to fill your day with “stuff,” or to focus on the areas you’re most comfortable. It’s human nature. But, what if we sat down and made a list (paper or electronic) of what our day consists of? Would we like what we see? Do we like what we fill our lives at work with? Too often I hear people churn on what isn’t happening, or what’s not being done. There’s validity in that, but the approach isn’t constructive. Making strides forward with intent with what you have available (culture, resources, staff, etc.) is much healthier. It reminds me of the good people I was with this weekend. Maybe we would all benefit if we were a little more “full” like the Amish. What do you think? Author Steve Browne (Admin)Posted on January 17, 2012 Categories HR Strategy, LeadershipTags Change, culture, Development, Difference, employees, Human Resources, Learnings, Life9 Comments on Are you full ?? Normally, I don’t post twice in a week. My “regular” day to compose is Sunday. But, with Christmas Day being Sunday, I won’t be posting. There’s a much bigger reason for this that deserves a story . . . In 1993, my wife and I had her extended family over for Christmas Eve and were preparing the obligatory feast when my wife exclaimed, “Steve, I think my water just broke ! !” You see, we were expecting our first child who wasn’t due until mid-January of 1994. She asked, “What should we do?” And, being the ever empathetic husband, I said, “Let’s eat ! !” – and we did. We shared our meal with our family, calmed down, and then we headed down the highway to the hospital. That year in Cincinnati we had snow and ice all over. Did you know that you can travel without much traffic on a Christmas Eve night even in bad weather? I think we saw 10 cars in the twenty mile trek we had to the hospital. During our trip my wife was riding next to me crying. She didn’t want our child to be born on Christmas. We talked about every bad scenario about how our child would be “cheated” because their birthday was on a holiday. Odd, that we weren’t focusing on the amazing miracle about to happen !! When we arrived at the hospital, my wife was one of two women who were about to give birth. Our beautiful daughter, Melanie, waited the night and arrived early Christmas morning !! It was amazing and something I will never forget or regret. Here she was five weeks early, and the best Christmas present I will EVER receive !! She was cooing and healthy when she was carted down the hall to the nursery. After giving my wife a kiss for making it through the delivery like a champ, I wandered down the hall to get another glimpse of my daughter. There was fresh snow on the trees, buildings and streets that I saw in the hallway window as I sauntered down to see her. It was just like the movies. And then . . . the miracle. Looking through the nursery window, I saw my daughter stuffed into a large stocking being held by Santa Claus in a rocking chair. Tears exploded from my eyes. I couldn’t believe what I saw sitting before me. Santa looked up at me, smiled, hugged my daughter and waved to me as if to acknowledge the beautiful gift of life that came to us that morning. I ran down the hall to tell my wife what I just saw. I ran back to see if I could get a picture, and he was gone. Of course he was because he was off to do what Santa does for all families and children. Our “miracle” turns 18 on Sunday. This stocking baby is now a young woman about to embark on her next stage in life when she leaves our home to attend college in the Fall after graduating in the Spring. She is amazing and continues to be a blessing to me and all she touches. I wanted to thank all of you who take the time to read this blog. 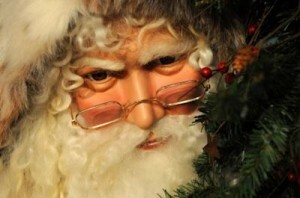 I value each one of you and want to wish you, and yours, a blessed Christmas and Holiday season !! May the coming year be filled with miracles for all of you !! Author Steve Browne (Admin)Posted on December 21, 2011 Categories HR Strategy, Random ThoughtsTags Christmas, encouragement, HR, Joy, Life, Miracles12 Comments on Believe in Miracles !! Have You Played Lately ?? I have !! Man, the past few weeks have been full of FUN !! And, I work in HR !! How cool is that? We had our Christmas Party for our store Managers at Star Lanes at Newport on the Levee. There was bowling, eating and billiards surrounded by tons of laughter and stories. It was very casual and loads of fun !! I also had the privilege of speaking at the chapter meeting of the Greater Cincinnati HR Association (GCHRA) and the event sold out !! Yikes !! The presentation was on Leadership through HR, and I had a blast. Lots of laughter, stories and food !! Then, this weekend I went to the National Museum of the US Air Force on the Wright Patterson Air Force Base with my Boy Scout Troop. We went through the miles of planes and years of history on a scavenger hunt, took in an IMAX movie and even got to tour through past Air Force One planes. The boys (and certain adults) let their imaginations run wild and pretend we were fighter pilots. We all picked our favorite planes that we just HAD to have !! Again, more laughing, fun and memories. The ironic thing during all of these activities . . . no one got hurt. No one was upset. No one was negative. It made me start to reflect about what we do in HR. Is it fun? Do we allow people to play? Or, are our processes more important than people? How about our Associations, Conferences and gatherings? Fun ?? Parts of them are, but there are also a myriad of rules and structures with good intentions, but limit people from enjoying themselves. Why is this? Is someone playing at work, or having fun that threatening? I’ve said this before. Do you know what happens to kids when they grow up? They become our employees !! This week start a new practice before people make silly New Year’s Resolutions that they will strive to break vs. keep. Have fun at work !! Quit looking for others to engage you. Be engaged first yourself !! Fun is different for all of us, but look around at your company’s culture and see if it fosters creativity or compliance – innovation or conformity. I plan to play more and more and pull others along with me. Let’s see who’s more productive in the end !! Author Steve Browne (Admin)Posted on December 11, 2011 Categories HR Strategy, LeadershipTags Change, creativity, culture, Difference, employees, engagement, Fun, Human Resources, Innovation, Leadership, Life, workplace1 Comment on Have You Played Lately ?? 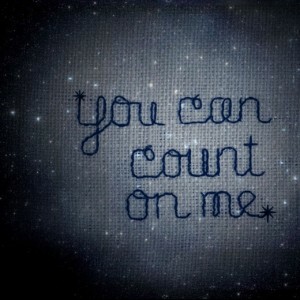 You can count on me !! You may, or may not know, that I am an incredible music freak !! 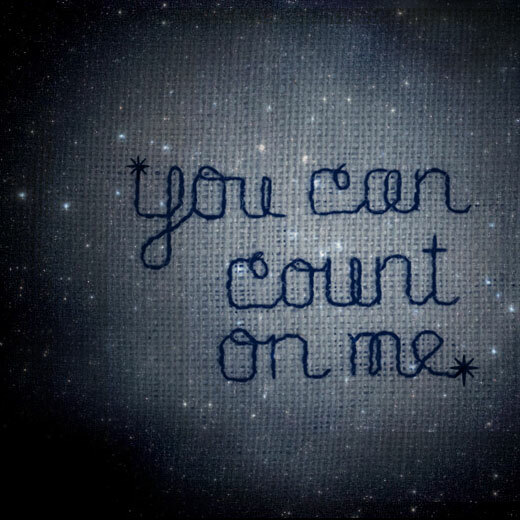 I can’t get enough of it and this Thanksgiving weekend a true classic popped into my head – Count on Me by Jefferson Starship. When my extended family gathers for either Thanksgiving or Christmas, we call it BIG Thanksgiving or BIG Christmas because there are so many family members that attend. Before we eat and open with a prayer, we count off – literally. We have had a few family members pass away over the years, but we never stray from this tradition. So, it begins 1 . . . 2 . . . 3 . . . 4 . . . etc. until we get around the oval. (It’s never a circle because there are too many folks.) This year we had 35 and it’s been as high as 60. Included are aunts, uncles, cousins, their kids, and starting this year the newest generation has it’s first engaged couple. I know that you need to be careful about what you do/don’t share on-line, but I’m 47 years old and completely cool with that. If you met me you’d say I’m at least 28, so age is not the focus here. My family has been getting together intentionally between 50 to 60 years because I have aunts, uncles and cousins older than I am. Think about that. Being together, intentionally, for 5 to 6 decades and NEVER missing a holiday. We’re not unique in this and I’m sure there are families who have met for centuries, but the point of the gathering is this . . . we COUNT on each other to be there all the time. It’s a great example for you personally as well as an HR professional. You NEED to be counted on, and others NEED to count on you !! Too many employees are out on their own within a company and they need someone they can rely on. Remember, you aren’t their for Management, nor are you there for employees. You’re there for EVERYONE !! Is that how you approach HR? Have you even stepped back to look lately? Just think how HR would be viewed in organizations if people knew they could be counted on !! This week, start something new and reach out to someone in our profession and get connected. Be someone that others can count on !! Author Steve Browne (Admin)Posted on November 27, 2011 Categories HR Strategy, LeadershipTags connections, culture, employee relations, employees, encouragement, HR, Human Resources, LeadChange, Leadership, Life, networking, SHRM, workplace3 Comments on You can count on me !! As my iPod continued on its endless shuffle at work, Rehumanize Yourself by The Police came on, and I found myself hitting repeat several times. The song tells of people in “everyday” jobs who are reminded to humanize themselves because their work doesn’t really mean much. Who knew that this song still has significance 30 years later? I’m not writing about employees who seem to slog through the daily grind, I’m talking about HR practitioners !! The job that HR does these days ranges from the ideal to the mundane. It’s hard to find a sweet spot to truly excel in HR within organizations due to a myriad of reasons. I’m not trying to define what may be ideal for some and mundane for others. Where I’d like us to focus is this . . . humans are more important than systems !! Systems are needed and provide great structure and definition. Without them people make things up because they really want to do a good job. But without definition, they’ll make it up to fill time and make sure they are “busy.” These folks are the sloggers. They come in every day, knock out a job and then go back to what truly interests them. Their jobs are a necessary evil to pay the bills. Oh, yeah, I’m still talking about HR people. No one said that HR had to be mundane !! In fact, great HR is far from it. However, it means getting outside the systems we create and enforce to the real heart of our businesses – the humans. Where are you on the spectrum? I get it that you can be creative in making new systems and that you can be broad in the “things” side of what HR has to offer. But I’d challenge you in that those things impact people. At the recent OHSHRM Conference, I challenged the attendees to be positive the whole time at the conference. Sounds odd that you’d even have to say that doesn’t it? But, I felt it was needed because I hear so many people stuck in what they’re NOT doing vs. what they do so well !! I only heard positive things from people because they knew a different expectation was set for them. In organizations, HR has to set that expectation themselves !! So, this week be positive and encourage others to see what amazing things are truly happening all around you that you’ve been missing. Make sure to . . . rehumanize yourself !! Author Steve Browne (Admin)Posted on October 9, 2011 Categories HR Strategy, LeadershipTags Change, culture, Diversity, employee relations, HR, Human Resources, LeadChange, Leadership, Life, workplace2 Comments on Rehumanize Yourself !! Gir and a Mix CD . . .
Did the title grab your attention? Hope so because last week I had two very cool things happen !! I received two surprises that solidified my contention that we have to quit talking about the “echo chamber” of HR folks in social media. 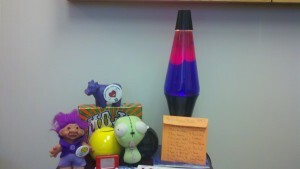 The first event was the arrival of Gir – the constant companion of Shauna Moerke (the HR Minion). Gir has been around many different HR Conferences and events. 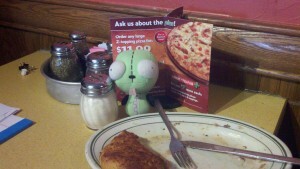 When Shauna asked if anyone would like Gir visit, I couldn’t pass up the chance for him to experience LaRosa’s. We visited one of our locations to have a calzone. I actually took Gir with two of my staff and when I said that he was joining us, they said, “Of course he is.” I guess working with me for awhile, they have come to understand that I look at HR differently. After a great meal, we came back to my office to find the second cool gift of the week. I received a mix CD from David Kovacovich from Michael C. Fina. It is an incredible mix of newer Indie music. David told me he made it because I write a song each week that makes fun of HR on the HR Net. I tend to parody more of the Classic Rock genre and David wanted to make sure my tastes stayed current as well. To capture the moment, I took a picture of Gir with the mix CD (songs handwritten on the back) with some of the decorum from my office. The reason I find these two events so cool is that we tend to think of people who are active in Social Media as HR pros as either avatars or people that exist electronically. It is so far from the truth !! We have to realize that first and foremost, we want to have true connections in our lives. This isn’t a “brand” thing or a response to people who choose to have an on-line persona that doesn’t match them in real life. Reaching out like this just shows how we still like to share things that matter with others. It reminds us that we can always stay young at heart and do simple things that matter. This week, I’m writing to those who are also active in the “echo chamber.” Two things to leave you with. (1) Reach out to others and make the connection to show others how amazing you really are !! and (2) The chamber will only expand and someday include all HR pros only if you wish to become connections and not personalities. I’ve been fortunate to meet many of the voices who are truly moving HR forward and they rock !! Reach out this week. Take the action to do something cool. It still matters. I need to go know as Gir and I listen to Track 3 on my new CD from Noah & the Whale. Author Steve Browne (Admin)Posted on August 22, 2011 Categories Random Thoughts, Social MediaTags connections, encouragement, friends, HR, HRevolution, ILSHRM, Life, OHSHRM, social media2 Comments on Gir and a Mix CD . . .
Come on Get Happy !! When you saw the title of this post it either made you smile or cringe. Do you need to be “happy” at work? Heck, can you even be “happy” in HR ?? The cynics out there, many of whom are my dear friends, would be saying things like, “It’s not the 70’s again !! 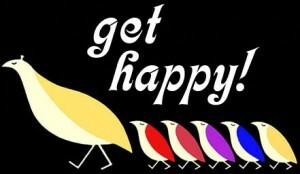 This isn’t The Partridge Family ! !” Some people at work, and life in general, feel that making someone happy is imposing on their personal space or beliefs. Others, refusing to be happy, come to work everyday in a dark mood while ominous dirge-like music plays in the background. There are countless statistics that now show that most people want to leave their job for something else. For some – ANYTHING else !!! So, why am I going on and on about being happy? It’s because I’m knee deep into a great new read called The Happiness Advantage by Shawn Achor. It’s a fascinating book that hit at the right time. The premise is counter to most of the history of the field of psychology and that is this . . . If you are happy, you’ll be successful. Achor points out poignantly that all of us have been looking at this the other way around – When I get successful, I’ll be happy. However, the research shows that people never feel they’re successful enough – ever. So, what does this have to do with HR? EVERYTHING !!! Many HR people I know are miserable in what they do. They are burdened by the reality that working with and dealing with people is rough. There is no doubt about that. But, you don’t have to be miserable. One of my friends visited one of our franchise locations a few years ago when I just had joined LaRosa’s, Inc. He asked the owner if he knew me and he said, “That’s the new HR guy isn’t it? Man, what’s wrong with him? He’s happy all the time ! !” Great isn’t it? The owner and I know each other more now and he’s a great guy. He still wonders how I can be happy and be in HR. So, this week ask yourself . . . happy ?? I think Achor is dead on by his premise that a person needs to be genuinely positive before they’ll ever be successful. What do you think ?? Author Steve Browne (Admin)Posted on July 31, 2011 Categories HR Strategy, LeadershipTags Change, employees, encouragement, GCHRA, Happy, HR, HRevolution, Joy, Leadership, Life, OHSHRM, SHRM, workplace9 Comments on Come on Get Happy ! !